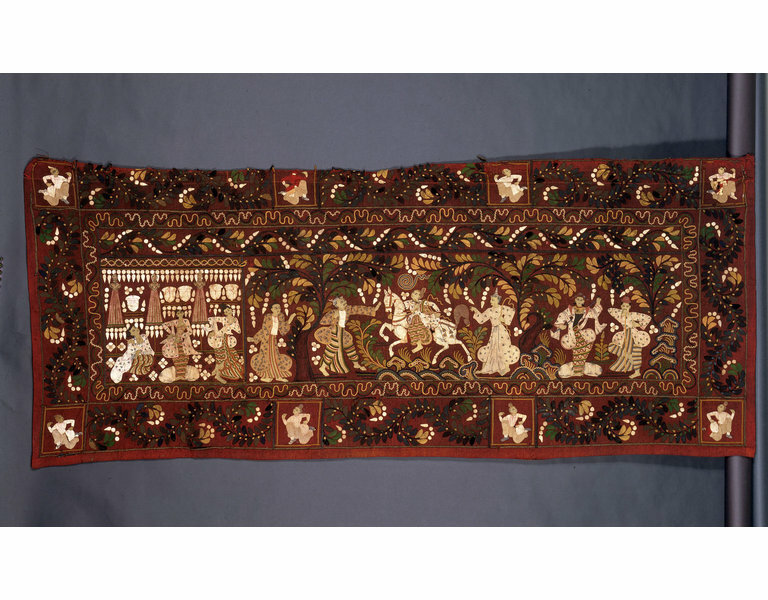 This is a fine example of a Burmese pictorial textile hanging known as a kalaga was obtained by the donor, a British architect working in Burma in the late 19th and early 20th centuries. It would have been used as a decorative wall hanging, a room partition, or as a screen hung outside the house on festive occasions. 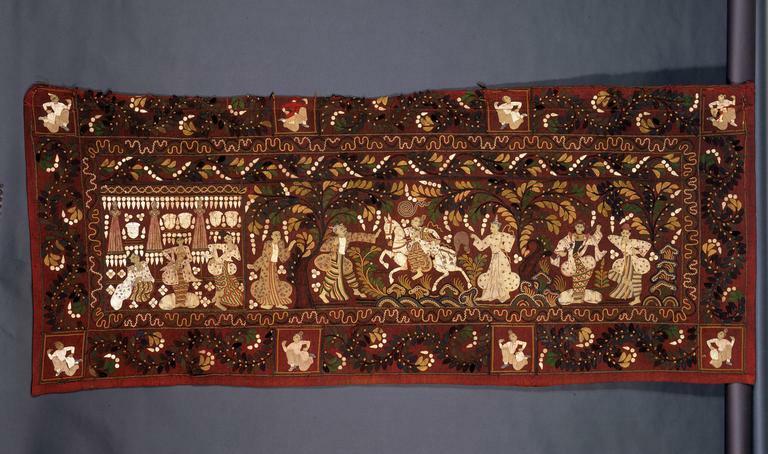 This example, illustrating scenes from either Burmese legends or the Buddhist Jataka stories (which is yet to be identified), is made of stitch-work and appliqué of partly painted coloured textiles on a red wool ground. The costumes of the figures are depicted in the stylised tradition of Burmese theatre relate to the fashions worn in the Mandalay Court of about 1880. 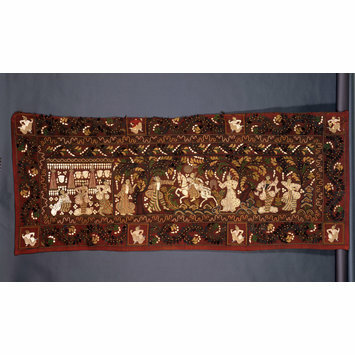 Kalaga or hanging of wool, appliqué embroidery in coloured felt and wool, partly painted, cotton, braids and sequins. Red ground with the central design within a border of leaf arabesques interspersed with kneeling male figures includes the following scenes (from left to right): Within a palace interior, furnished with three umbrellas, chandeliers and a series of crystal drops, a prince and princess, attended by a maid of honour, pose elegantly; Outside, in a woodland setting, a male figure watches an official trying to stop a princely rider on horseback. Behind him a figure a nat (spirit) points in his direction; Still in a woodland setting a nat-gadaw (spirit medium, identifiable by her headdress) hold a wand. She is obviously in a trance as her slim body appears to be contorted. Besides her a smartly dressed man stands watching, holding a long walking stick and with his chin resting on it. The figures are dressed in the fashions worn at the Mandalay Court ca. 1880. The subject matter (which is unidentified) is from a Jataka story or taken from Burmese legend. Kalaga obtained by the donor while he was working in Burma as an architect. He did military service there 1914-1920, and also worked on the Monasteries and temples of Pagan. Attribution note: This kalaga was probably made in the same late 19th century workshop and the designs created by the same artist as: IS 2-1963; IS 44-1967; IS 3-1963; IM 47-1925; IS 76-1957; IM 159-1924.